A coronal mass ejection - or solar storm - is set to impact Earth's magnetic field today. A massive explosion on the Sun has caused a solar storm, which is expected to reach Earth this weekend, potentially disrupting local communication systems like Internet, cellphone and radio communication, global positioning systems and DStv. The Space Weather Centre of the SA National Space Agency (SANSA) says the eruption, which took place on Wednesday, sent a coronal mass ejection (CME) travelling towards Earth at approximately 1 493km per second. The CME is expected to impact Earth's magnetic field today, with moderate disturbances to communication systems expected over the weekend. A CME is a massive cloud of high energy particles ejeted from the surface of the Sun when stored energy is suddenly released, explains SANSA. "When the magnetic field of a CME interacts with the Earth's magnetic field, it causes a temporary disturbance known as a geometric storm." SANSA notes this is a two-part phenomenon. "On 10 September, we observed an X1.6 solar flare, which was one event and associated with that was a CME (event two). Impact of event one is immediate on the sunlit side of Earth, [while] the impact of event two is the one we are expecting to arrive on Earth today." SANSA says the impact of the CME will not harm humans or any other life forms on Earth, as we are protected by the Earth's magnetic field. As for SA's communications systems, says the agency, these are likely to be disturbed to some degree by the storm, but not completely interrupted. "Our predictions based on our network of instrumentation and models show us the impact from this storm is going to be moderate. "Based on previous experience, we are fairly certain that the disturbances will only be moderate; however, SANSA will continue to monitor the effects and impacts." 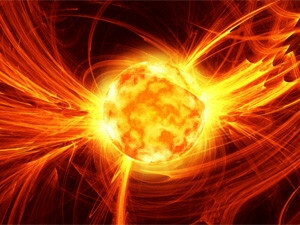 While solar events are seen globally, SANSA says visual effects of the solar storm will only be seen at high latitudes. As to whether South Africans can expect any spectacular solar displays this weekend, SANSA says: "Unfortunately, SA is at mid-latitudes and the intensity of this storm will not result in any visual effects being seen from SA this weekend. "However, if you happen to be in the high latitude northern countries or fortunate to be in Antarctica, you will be in for a special display."